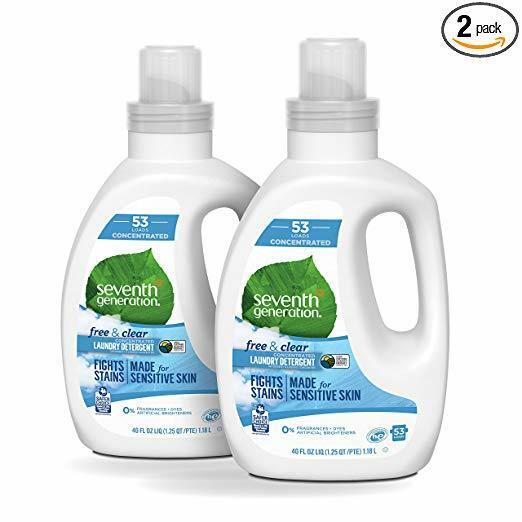 Seventh Generation Concentrated Laundry Detergent is the product you are looking for if you want something that is effective, yet gentle for sensitive skin. This stuff currently has a 4.1 star rating and carries the Amazon Choice badge. But is everything under the hood what it seems? Only one way to find out. Seventh Generation is a good enough brand that we have featured multiple times on this website. Their products contain wholesome and natural ingredients, but they do also use certain artificial ingredients from time to time. Nevertheless, their products are effective and affordable, which makes them great for people trying to get away from the harmful chemicals often found in regular products. Seventh Generation Concentrated Laundry Detergent is no different. From first glance, it seems like this detergent is effective and trustworthy. They have multiple certifications on their bottle to ensure customers are getting a quality product. Like other Seventh Generation products, not everything in Seventh Generation Concentrated Laundry Detergent is natural. While the majority of their ingredients are derived from plants, there are two synthetic preservatives that are added to this detergent. People who are trying to avoid all chemicals in any way, shape, or form may find this to be a deal breaker. But for good measure, here is the complete list for those who are still on the edge. Water, laureth-6, sodium lauryl sulfate, sodium citrate, glycerin, sodium chloride, oleic acid, sodium hydroxide, calcium chloride, citric acid, protease, amylase, mannanase, benzisothiazolinone and methylisothiazolinone. While a scent is not particularly needed when it comes to laundry detergents, it is definitely welcome. Many people believe that if your clothes do not come out smelling like flowers or citrus, that means they are not clean. This is not true in the least, but because it has been ingrained in our minds for so long, it is still a good idea to use a fragrance in your detergent, from a business standpoint. Seventh Generation Concentrated Laundry Detergent does not include a scent, so be prepared for that. The best thing about this detergent is that it is completely free of any and all chemicals. Seventh Generation Concentrated Laundry Detergent contains no phosphate, chlorine, ammonia, petroleum solvents, butyl, glycol ether, brighteners, SLES, SLS, or EDTA. In addition, their detergent is also USDA Certified Biobased with 96% of their ingredients being plant-based. When it comes to buying detergent, Seventh Generation Concentrated Laundry Detergent is about as cheap of a natural detergent as you are going to be able to find. However, the bottles are fairly small, and being a liquid detergent, the liquid can easily be over used. So if you want this detergent to last you the 106 total loads, stick to and maybe even below the recommended measurements. While the price is a great factor, it should also be an effective product. For the most part, people seem to find Seventh Generation Concentrated Laundry Detergent very effective at cleaning clothes and dealing with stains. Grab Green Natural 3-in-1 Laundry Detergent is designed to get the cleanest clothes possible with having the smallest impact on the environment. Even though there are two synthetic ingredients, neither of them pose any risk to your health, or the health of the environment. In addition, the bottle the detergent is packaged in is made of 100% recycled plastic, which lowers the environmental impact this brand has. Not to mention none of their products have been tested on animals. For the past 30+ years, Seventh Generation has been a strong supporter of the rights of people and the planet. They are dead set on providing a product that uses natural, plant based ingredients and minimal chemicals to better the lives of their customers and the environment. They found that using plant-based ingredients in more sustainable than using petroleum ones. In addition, they have started using recycled plastic and other materials to create their packaging, in an effort to lower the amount of waste that is, well, wasted. Their product line is quite expansive and include natural based products from trash bags, all the way to baby care and household cleaners. Seventh Generation Concentrated Laundry Detergent is natural and biodegradable. When you use Seventh Generation, you won’t be adding harmful chemicals to the environment or your septic tank. This laundry detergent is extremely cost-effective. Make sure you use the correct amount and this detergent will last you a long time. If you are looking for a trustworthy brand with nothing to hide, look no further than Seventh Generation Concentrated Laundry Detergent. All of their ingredients are listed, as well as their roles and sources. In terms of being environmentally conscious, Seventh Generation Concentrated Laundry Detergent is ahead of the game using recycled plastic and other materials for their packaging, as well as being a B Corporation. This detergent comes in a 2 pack, because both bottles are relatively small. Plus seeing as it is a liquid, you have to be very careful how much you use. While the synthetic preservatives inside Seventh Generation Concentrated Laundry Detergent does reduce its quality a bit, both of the ingredients are not harmful in anyway. Now, some people may still choose to avoid this product because of that, and that is fine. But nevertheless, this is a very effective and safe detergent that you can feel confident in using for any type of fabric. However, you may end up buying more of it on a regular basis. The size of the bottles definitely reflects its price and not in a good way. It may be a good idea to buy more, or choose a larger size. Overall, Seventh Generation Concentrated Laundry Detergent is a great product that gets the job done and leaves the smallest impact on the environment as possible. Regardless of the synthetic ingredients that are added, this product is still very much worth your money. Speaking of which, if you want to try Seventh Generation out for yourself, you can grab a 2 pack of the unscented on Amazon for $25.99. For more information on the best natural laundry detergent, check out the rest of Green and Growing. Here are some top questions that I found for people seriously considering buying the Seventh Generation Natural Liquid Laundry Detergent. Can this be used in HE machines? Yes, it is safe for any type of washing machine.